61 62 Corvette C1 Original GM Front Bumpers LH & RH-Prof Triple Rechromed--NCRS! 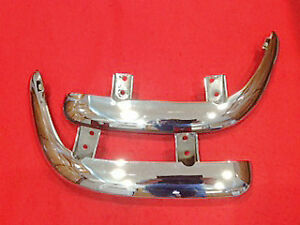 Details about 61 62 Corvette C1 Original GM Rear Bumpers LH & RH-Prof Triple Rechromed--NCRS! 61 62 Corvette C1 Original GM Rear Bumpers LH & RH-Prof Triple Rechromed--NCRS!